Rabbit anti Human, Mouse, Rat C1QTNF2. 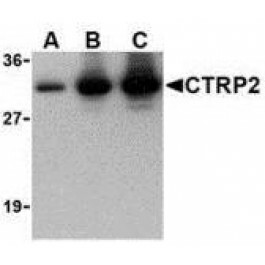 Western Blot: CTRP2 antibody can be used for the detection of CTRP2 at 1 μg/ml. Caco-2 cell lysate can be used as positive control. These proteins are often highly modified post-translationally and migrate in SDS-PAGE at positions other than their predicted size. Fantuzzi G. Adipose tissue, adipokines, and inflammation. J. Allergy Clin. Immunol. 2005; 115:911-9. Tsao TS, Lodish HF, Fruebis J. ACRP30, a new hormone controlling fat and glucose metabolism. Eur J Pharmacol. 2002 Apr 12;440(2-3):213-21. PubMed PMID: 12007537. Wong GW, Wang J, Hug C, et al. A family of Acrp30/ adiponectin structural and functional paralogs. Proc. Natl. Acad. Sci. USA 2004; 101:10302-7. Shapiro L, Scherer PE. The crystal structure of a complement-1q family protein suggests an evolutionary link to tumor necrosis factor. Curr Biol. 1998 Mar 12;8(6):335-8. PubMed PMID: 9512423. CTRP2 antibody was raised against recombinant human CTRP2. 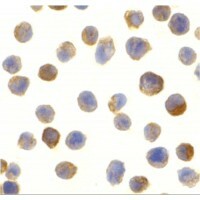 Transient overexpression cell lysate was tested with Anti-C1QTNF2 antibody (H00114898-M01) by Western Blots.